Preparing the garden beds is a fun job for kids that will help teach them the planting basics. Even toddlers watch sprouts poke their little green heads out of the backyard soil with a sense of awe. Our job as parents is to keep them in that frame of mind and not wreck a good thing. That's tougher than it sounds because gardening can be hard and tedious. We have to devise ways to keep that sense of wonder alive throughout their childhood. 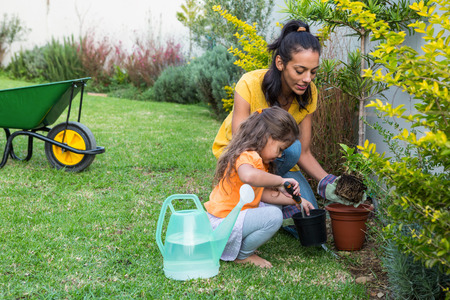 These 5 tips for gardening with kids can help get things started on the right foot. Garden beds need to be prepared. First, tidy up. Rake up all the debris and dead plant material left over from winter and put it in the compost pile. Now, dig prepared compost into the flowerbeds to reinvigorate the soil for the growing season. Now, it's time to decide which plants go where. Get a big sheet of paper and help the kids draw the garden designs. If you don't want your yard designed by a 4-year-old, consider giving him an area that's just his. A little patch under the tree in the backyard, perhaps, or some pots for container gardening. Just let him be master of some part of the gardening universe. As you're planning your backyard garden, make it a learning experience. Talk to the kids about how different plants have different needs. Show them how to read plant labels to see how much sun and water particular plants require. Walk around the yard and discuss which parts look sunny, which parts look shady, and which plants might be happier where. You'll find that choosing a theme makes gardening more special for them. Give them a budget and let them choose the plants for their own plots. They will be honing artistic and mathematical skills while they shop. The more that kids are involved in the conceptual part of gardening, the more they will be interested in the maintenance. Once your kids have their own little backyard plots, help them be successful gardeners. Show them how to dig a bigger, better hole for a happier plant. Teach them how to handle the roots carefully to prevent injury. Help them gently water the plant and then return to water it some more after the initial watering has settled. Explain how just-planted plants will need more water until they get established. After you've planted, it's helpful to mulch. And mulch again. And mulch some more. You can use wood chips, straw, or even compost for mulch. I prefer using organic material because it will eventually release nutrients to the soil after it breaks down. Mulch accomplishes three things: It helps hold water in the ground so you don't have to water as often, it helps hold warmth in the ground so plants grow faster, and it helps keep weeds from sprouting. Mulch is a serious weed deterrent only if you mulch 4 inches deep. But any mulch at all helps because weeds in mulched soil are easier to pull. After planting, encourage kids to make little markers for their plants saying things such as, "Hi, I'm Marigold." You don't need to motivate your kids for this one! Kids love to pick veggies and fruits. Be sure to supervise at harvest time, however, or you may be dining on those trendy "baby" veggies. Kids usually can't wait to pick veggies until they're fully grown! Now for the best part of backyard toiling: Enjoy the fruits of your labors!